Just like an ordinary light bulb, with extended use the lamp in your BenQ projector will begin to dim and eventually fail. After your BenQ projector has been operated for a thousand hours or more over many months or even years, you may begin to notice that the projected image seems dimmer, the colors faded. It's likely that the problem is a failing projector lamp. Luckily, with your BenQ projector's thoughtful lamp housing design, replacing a worn lamp is little more difficult than replacing a light bulb. 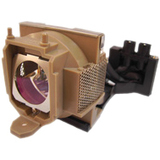 And when it is time for a new projector lamp, a BenQ replacement lamp offers several key advantages. BenQ lamps offer exceptional quality, validated through an extremely rigorous battery of tests in three key areas: reliability, performance, and safety. The tests meet or exceed industry standards for lamp quality testing, ensuring that you are installing the best possible replacement lamp in your BenQ projector. BenQ's reliability tests include checks on spot temperatures on the lamp at key locations that might be vulnerable to overheating. In addition, temperature monitoring is conducted on key components in a projector in which the lamp is installed, to verify that the lamp doesn't create an undue thermal burden for the unit as a whole. Performance tests for BenQ bulbs include rigorous individual tests for brightness, brightness uniformity, color, and color uniformity. Together, these tests ensure that with a BenQ replacement lamp installed, your BenQ projector will deliver the same dazzling picture quality it did on first use. BenQ also applies strict safety tests to its lamps, carefully gauging their behavior in extreme conditions such as when burst due to excessive heat, physical damage or other unforeseen factors, and when a projector is subjected to various hazards, such as liquid spills or impact shocks.